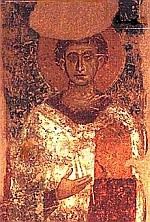 Pope Saint Simplicius was pope from 468 to March 10, 483. His teachings about the nature of the Godhead, now referred to as Arianism, provoked great controversy within the fourth-century Church through their assertion that the Son of God, incarnate as Jesus Christ, was not consubstantial or coeternal with the Father. 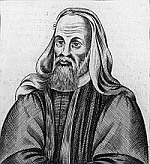 Pelagius (ca. AD 354 – ca. AD 420/440) was an ascetic who denied the doctrine of original sin as developed by Augustine of Hippo, and was declared a heretic by the Council of Carthage. His interpretation of a doctrine of free will became known as Pelagianism. Giraldus Cambrensis, a 12th century writer, describes a beautiful manuscript long assumed to be the Book of Kells. What if rather than the Book of Kells, he discovered a second book lost to history? Would this book tell a different story of women than the story of the official one sanctioned Roman Christian Church? Alexandra Patterson journeys to Kildare, Ireland in order to appraise items from the Church of Saint Brigid. While examining a reliquary box, Alex discovers a leather-bound manuscript. As Alex tries to authenticate the date of the Book of Kildare, a book that might predate the Book of Kells, the story of Brigid's life unfolds in a separate parallel narrative through a saint's life and the letters of Decius, a monk sent by Pope Simplicius, bishop of Rome, to spy on the Abbey of Kildare. The pope commissions Decius to spy on this abbey run by a woman to document the heresies practiced that threaten the Roman Christian Church. As Ireland becomes a pawn in the maneuverings of the Church, Brigid seeks to protect her country. Baptized by Patrick himself, Brigid becomes a force for Ireland's conversion to Christianity yet the relationship between Ireland and the Roman Church is precarious at best, particularly in an age when the Church's survival seems tied to the success of the Roman state itself. The letters of Decius reveal a man drawn to Brigid and her faith. Will he conspire against her or with her? Will Brigid of Kildare be able to save the image of the woman from erasure? Through alternating narratives, present and past, Heather Terrell's BRIGID OF KILDARE presents a portrait of Brigid of Kildare as a bold, unconventional leader who challenges the patriarchy of the Roman Church. She questions a god who disregards the intelligence and strength of women. Although forbidden as unorthodox centuries earlier by Iranaeus, The Gospel of Mary the Mother provides Brigid with an alternative understanding of Christianity, a Christianity where women are not merely passive vessels or simply absent in the life of Jesus. As a hybrid genre, BRIGID OF KILDARE will appeal most to those readers who prefer fictional imagination over a more purist view of historical fiction. If you are looking for an imitation of THE DA VINCI CODE or other thrillers of this ilk, BRIGID OF KILDARE is quite different in texture. While it lacks suspense and the mad race to the finish of those thrillers, this reader relishes the differences, particularly the author's use of medieval literary forms such as the narrative of saint's life that added a historical texture beyond historical facts and descriptions. While some modern day readers may find these forms more dry than modern fiction conventions, the historical narratives added a sense of mystery and authentic feel for this medieval literature fan while also inspiring the "what if" alternative feminist history thrill. Perhaps this novel would have benefited from more character development or more historical detail, but as it is, this medieval literature enthusiast found BRIGID OF KILDARE a fun, light read with just enough historical detail to inspire the imagination but not so much to include it in a list of more substantial, more erudite medieval historical novels. The present narrative interests the least although it provides a framework for the juxtaposition of the other two narratives. The mystery is not that mysterious, at least not in terms of traditional mysteries, the romance not fully developed, the subversion of the Roman Church's view on women not that subversive (at least from today's perspective), and yet, I hate to admit it, after reading countless medieval saints' lives in my past reading history, this reader rather enjoys all those aspects other readers might label dry. For this reader, the restraint and medieval literary forms employed by the author make this novel do more than less.